Every day, rivers carry sediment (soil and other debris) into the ocean where it collects on the continental shelf (submerged gently-sloping continental crust of the North America plate), and continental slope (steep transition to deep sea floor which is the Juan de Fuca plate). Over time, sediment accumulates on the shelf until it becomes unstable and slides down the continental slope, much like an avalanche, in what is called a turbidity current. The resulting layer of sediment that the turbidity current deposits are called a turbidite. A number of events can trigger turbidity currents including: tsunamis, storm induced waves, slope failures and earthquakes. Typically earthquakes are the cause; the reasons why are discussed below. 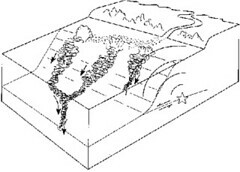 John Adams of the Geological Survey Canada suggested in 1990 that turbidity currents originating from different locations occurred simultaneously during great subduction zone earthquakes. When simultaneous turbidity current from different side channels merge, the main channel can be expected to show a single large turbidite. If the turbidites originated at different times in the side channels, the main channel would record each separate turbidite event. The consistent number of turbidites in core samples from the side and main channels indicate that the turbidity currents were likely caused at the same time, by the same event. Large storms are not a likely source of a coast-wide event because these storms produce waves that are not much larger that the smaller, more common storms. If these were the trigger, the turbidite record should reflect more than 13 events in the last 5,000 years. The 1964 Alaska earthquake generated the most recent, damaging, tsunami that struck the Oregon-Washington coast. Although this earthquake is one of the largest seismic events of the 20th century, it did not produce any recorded turbidites. If this large tsunami did not trigger a turbidity current, it is highly unlikely the turbidite record reflects the occurrence of tsunamis. In a slope failure, so much sediment develops on the inclined continental slope that it slips, much like an avalanche triggered by excessive snowfall. When enough sediment accumulates at a given point on a coastal slope, slope failure will occur. This underwater avalanche can cause turbidity currents to spread sediment throughout the underwater sea channels. Although these kinds of currents are likely to occur given enough time, the different rates of sedimentation and inclination of coastal regions make the synchronized turbidity currents in the core samples unlikely. Cascadia Subduction Zone earthquakes on the other hand likely provide enough force and affect a large enough region of coast to have caused the observed turbidite deposits. Great CSZ earthquakes have long recurrence intervals, as do turbidity currents. Radiocarbon dating of each turbidite in Adams' core samples show a recurrence interval of about 590 years, closely matching the interval of coastal subsidence observed in Washington. Chris Goldfinger of Oregon State University was recieving his Masters Degree at OSU when Adams was publishing his work on turbidites. In 1996 he began investigating the paleoseismic history of the Cascadia margin based on turbidite records with a team of scientists based at OSU. They conducted their first major cruise to test this hypothesis in 1999 aboard the R/V Melville. Goldfinger et al. have published several papers since then that expore in detail the realtionship between great earthquakes and turbidite stratigraphy in Cascadia. 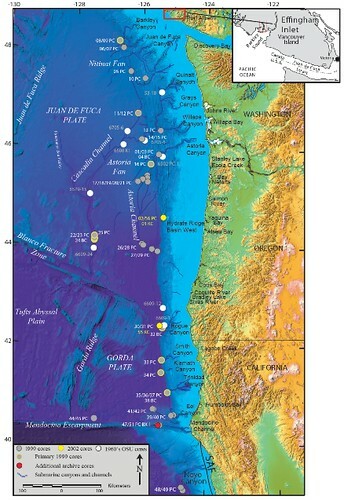 One notable conclusion asserted by the OSU research group is that the southern portion of the Cascadia Subduction Zone (CSZ) periodically produces M 8 sized earthquakes in addition to participating in the full-rupture M9 earthquakes that occur ~every 500-600 years on average. Incorperating their research findings into the National Seismic Hazard Maps is underway. We may find the reccurance interval for M>8 earthquakes on the southern CSZ to be closer to 340 years on average which might result in elevated hazard for South-West Oregon.